TOKYO (AP) — Empowerment of women and equal opportunities are crucial for driving a stronger global economic recovery, and for revitalizing Japan, the head of the International Monetary Fund said Friday. 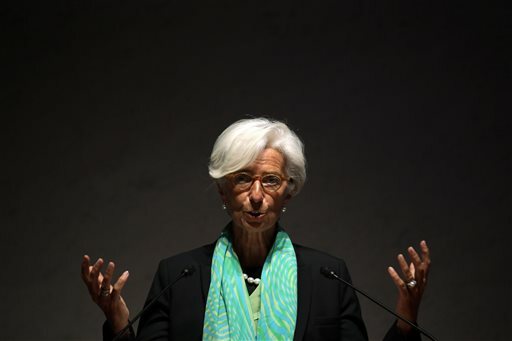 The global recovery is too tepid and too turbulent, IMF chief Christine Lagarde told a gathering organized by the Japanese government and business groups to support Prime Minister Shinzo Abe’s campaign to promote a bigger role for women in the economy. “Even after the crisis abates, we will face grave challenges to growth,” Lagarde said. The global economy is not utilizing women effectively and is “tossing away economic growth at a time when it cannot afford such wanton waste,” she said, noting the influence wielded by women, who account for about 70 percent of all consumer spending. Abe has made greater gender equality a priority in his “Abenomics” program aimed at propelling the world’s third-largest economy out of a long deflationary slump. As its workforce ages and shrinks, Japan needs women to help fill labor shortages and drive economic growth. Last week, Abe appointed five women as ministers in a Cabinet reshuffle, matching the previous record set by former Prime Minister Junichiro Koizumi. But overall, relatively few women hold political office or executive positions in business. Japanese women rank high in terms of education, but tend to put their careers on hold to raise their families. Long working hours and limited access to affordable child and elder care are obstacles for working mothers, while employment and tax systems are structured to favor families with stay-at-home moms. When women do return to work as their children get older, which most do, they generally can only get part-time, lower paying work. Countries need to change policies and laws, but also institutions, attitudes and culture in order to boost their growth potential by better using their female talent, said Lagarde. She praised Sadako Ogata, a mother of two and as a former United Nations High Commissioner for Refugees one of Japan’s foremost diplomats, as an example of the talent of Japanese women. “The most difficult part may be transforming the division of roles based on gender, something that is, unwittingly, firmly ingrained within us,” Abe told the conference, pointing to a male-dominated corporate culture where men take pride in how long they work and how little they sleep. “Women will come to shoulder important decision-making. They will also change the way we work. So it means changing the rules of the game that penetrate society,” he said. Some firms have begun heeding Abe’s call for all listed companies to appoint at least one woman to their board of directors. They also are beginning to take women’s ideas into consideration in product development, such as making car doors open wider to accommodate women holding children, or laptop computers easy to open without damaging a manicure, Abe said. Still, the cultural divide over gender issues was apparent during a joint appearance by Japan’s first lady, Akie Abe, and Cherie Blair, a barrister and the wife of former British Prime Minister Tony Blair. Asked about her aspirations as a young woman, Akie, the 52-year-old daughter of the former president of leading confectioner Morinaga & Co., said that like most young Japanese women at the time, she just expected to quit her job as soon as she married. “I didn’t have big dreams and aspirations,” said Akie Abe, who has praised her husband for promoting more opportunity for women and for taking on a share of the household chores. Blair, who was raised by a single mother and went to law school on a scholarship, said that at age 14 she told her classmates she intended to become Britain’s first female prime minister, a feat accomplished instead by Margaret Thatcher, a conservative.